It’s a few weeks into 2018; have you let your resolutions slide? If you did, you’re not alone. Most people’s resolutions don’t make it to February. It’s not that your money goals are unattainable, though there are ways to set better resolutions right from the beginning. The overall goal should not be your focus. The habits you put in place every day will make or break your success. 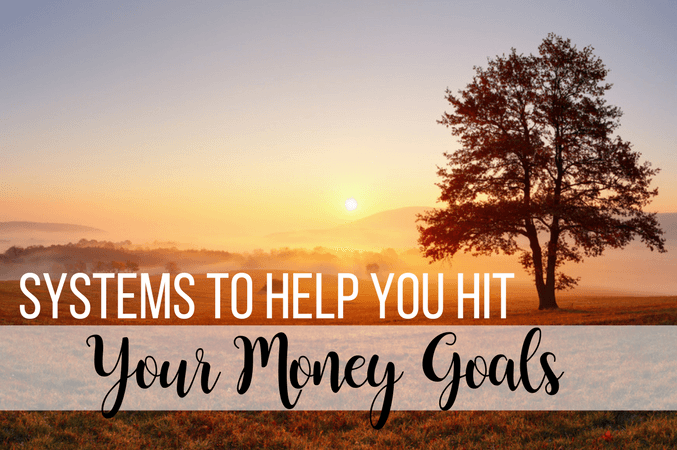 So if you find you’re already struggling to make your money goals a priority, here are some systems you can put in place to make success a habit. At this point in January, you’ve probably read this 500 times, but it’s worth repeating: Set actual goals. Write them down. Get very specific. Having a vague idea of where you want to go is not likely to get you there. Why is it worth the trouble? Because setting goals will keep you focused. In the end, your goals will probably be ever-evolving and might look entirely different six months from now. But setting goals forces you to ask questions, and evaluate where you want to go. It gives you a framework to start taking action. Plus, at the end of the day, checking off those goals is an excellent self-confidence booster. Automation is one the best, simplest ways you can save more money, cut down on debt and pay your bills on time. These habits are the little things that make up the well being of your finances. Automation means you don’t have to decide what to do with that money every month; it’ll get there on its own. Some brokerage or mutual fund sites allow you to automate your investing. Busy people, automation is your friend. Just make sure you check in periodically to verify that you’re still allocating money where and when you want to be. It’s the truth. Those little, day-to-day habits and expenses make up the whole picture, so pay attention to them. Simply tracking your finances can be a profound exercise in getting to know your money behavior. This works particularly well for anyone who hates budgeting or doesn’t think they need to budget because it isn’t a budget. All you have to do is write down all of the money that comes in, and all that goes out. If you’re skeptical, try it for one week. You are likely to find that you are spending more on some of those little things than you should, or that you have excess money you should put to work by saving or investing. Doing this repeatedly keeps you mindful of your behaviors, and allows you to see opportunities for improvement. Whether you’re 25 or 60, retirement is always looming. Retirement looks different for everyone, but it’s important that you’re actively planning for it, and keep it high on your list of money goals. It can be too simple to say you’ll invest more for retirement tomorrow, or next month, or next year. Get in the habit of monitoring your retirement savings annually, or more if you’re close to retiring. Saving something is better than saving nothing, so if you feel stretched too thin right now, put aside what you can and allow it to grow over time. Focus on intentional retirement planning. Too often, people assume their 401(k) will take care of them when they retire. Most people need to supplement with additional savings. You can use a retirement calculator to estimate how much you’ll really need, and make incremental adjustments over the years to get you to that point.